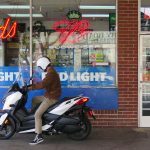 Yamaha’s new XMAX scooter appeared in the US last year with little fanfare – possibly because Yamaha didn’t want to call attention to the fact that its long-running and updated-for-2017 TMAX maxi-scooter came up missing about the same time. 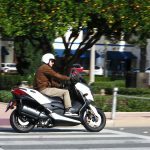 We were big fans of the TMAX, mostly because its powerful-ish 530cc parallel Twin, big-boy running gear and 15-inch wheels made it feel almost as much sportbike as it did scooter. Its price tag backed that impression up, unfortunately – $10,490 last time we tested one four years ago – which must have a lot to do with its new MIA status. 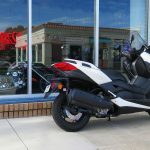 TMAX is still for sale in the rest of the world. 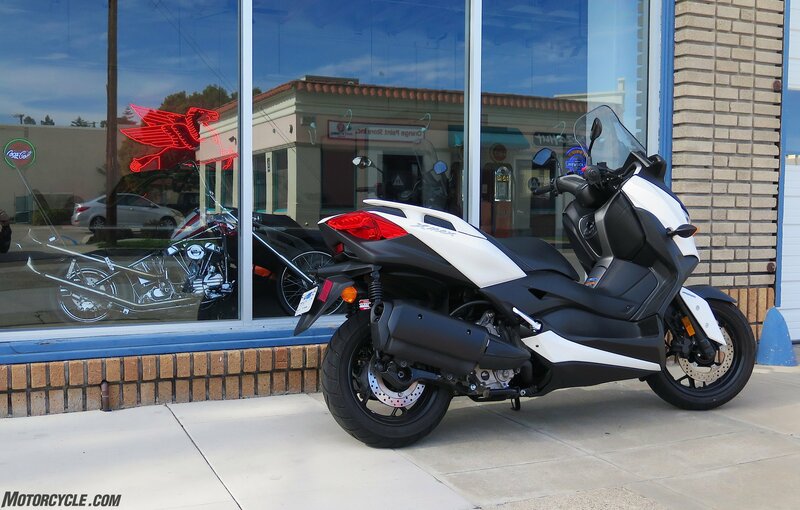 The new XMAX carries on the large high-performance look of the TMAX, at least, but does so with a 292cc liquid-cooled 4-valve Single rated by Yamaha’s UK website at 27.6 horsepower at 7250 rpm, and 21.4 foot-pounds torque at 5750 rpm. 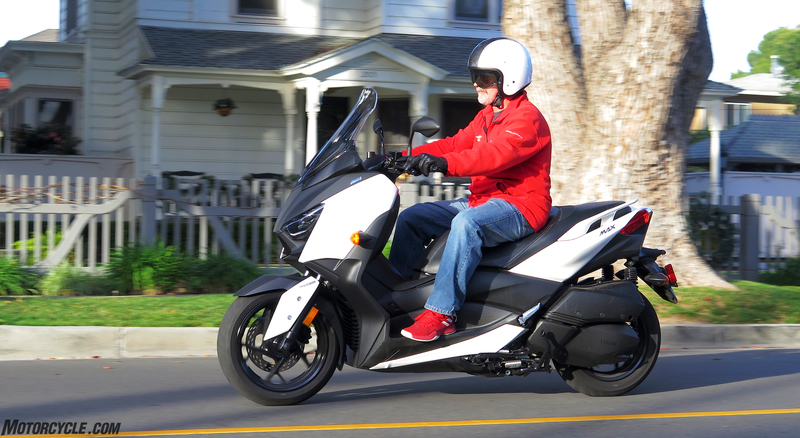 The TMAX is rated at 45 hp at 6750 rpm, and 39 ft-lbs at 5250 rpm. 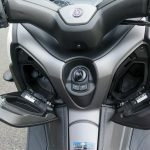 Wet-weight wise, the UK site has the TMAX at 470 pounds and the XMAX at 395 lbs, which agrees with Yamaha USA – so the XMAX’s 75 less pounds closes the performance gap a little. 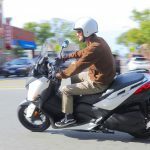 The TMAX’s big 15-inch wheels are responsible for a large part of its handling performance, and Yamaha has integrated most of that into the XMAX: Its 120/70-15 Dunlop Scoot Smart front is the same size as the T’s, and its 140/70-14 rear tire is close enough to keep it feeling perfectly fine at the remarkable speed it’s capable of (though the TMAX runs a 160/60-15). 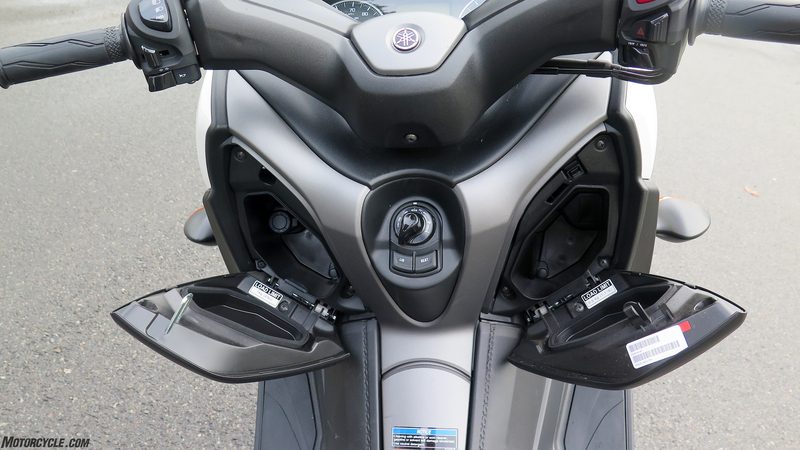 The biggest technological step backward compared to the TMAX takes place in the rear suspension department: Where the T uses a single-shock setup that gives it 4.6 inches of wheel travel, the new X has a pair of coil-over shocks stuck on out back that give it just 3.1 in. 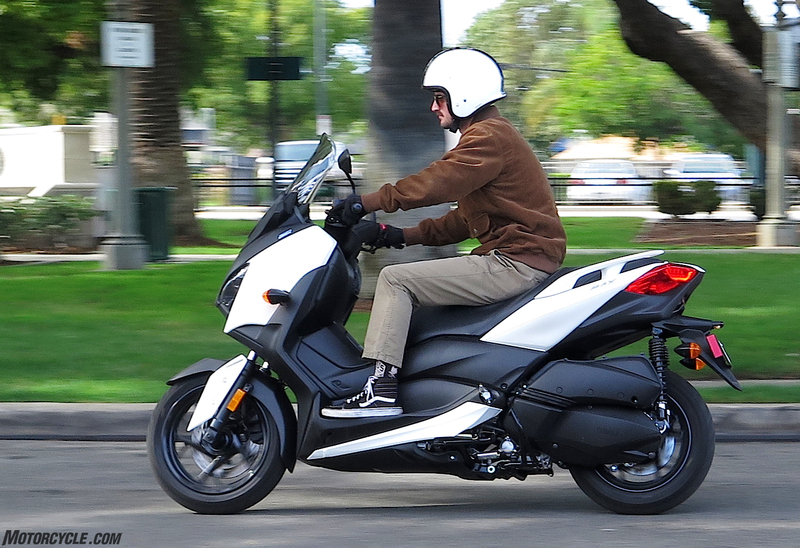 of travel, harshing the ride as well as the Jetsons futuristic styling motif. 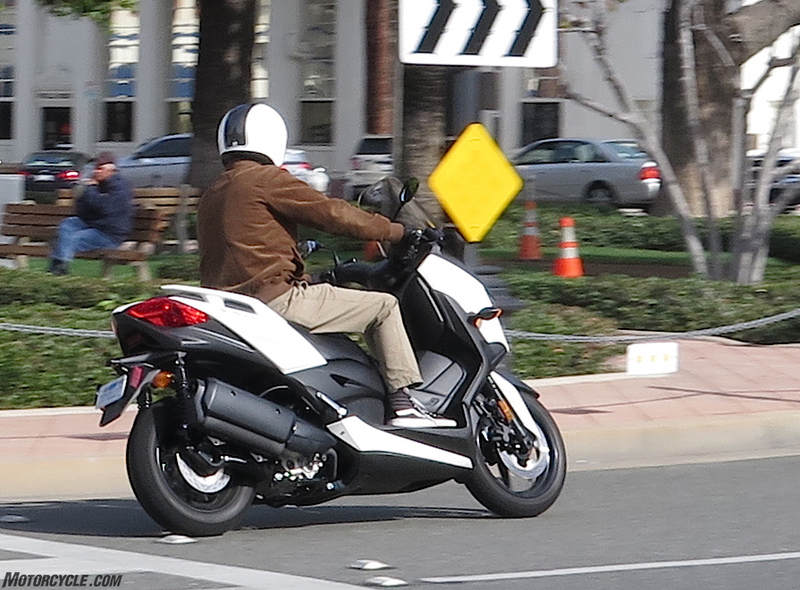 There’s an advanced 292cc liquid-cooled Single hanging onto the left side back there, too, with a lightweight forged piston and forged crankshaft, in an offset cylinder that’s lined with Yamaha’s DiASil aluminum “for excellent heat dissipation.” It’s counterbalanced for minimal vibration, and semi-dry-sumped for reduced friction and drag. All that unsprung weight doesn’t help the rear of the XMAX deal with serial bumps, either. But that’s the nature of the scooter beast, really, so no real complaint. Progressive springs help those 3.1 inches of wheel travel be as nice as possible, but she’s no Goldwing in the ride department. 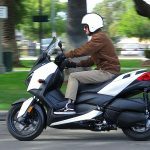 At 60.6 inches, the XMAX is about 1.4 in shorter of wheelbase than the TMAX, and its claimed 31.3-in seat height is ⅕-in lower. 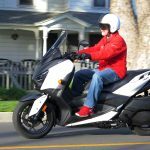 All in all, though, everything about the XMAX including its size says maxi-scooter – everything except the price tag, which says $5,599. That’s more like it. 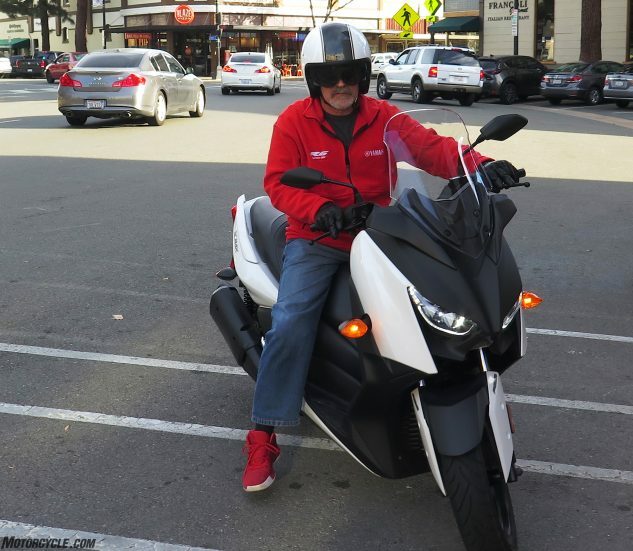 To be honest I knew zero about the XMAX when I picked it up at Yamaha’s SoCal HQ six or seven weeks ago, other than it was a new model. It looked a lot like the TMAX, so I hopped on and blasted off. Off the bat it didn’t feel as fast as some scoots, but not all that slow either. By the time I made my way to the wide-open carpool lane of the 22 freeway, I did what we don’t do a lot of anymore, sadly, in the modern era. I whacked ’er all the way open to see what she’d do, the kind of thing scooters encourage. Hmmm, 94 mph according to the speedo, at a bit over 7000 rpm, which seemed pretty accurate judging from the rate the minivans in the fast lane were being startled awake. 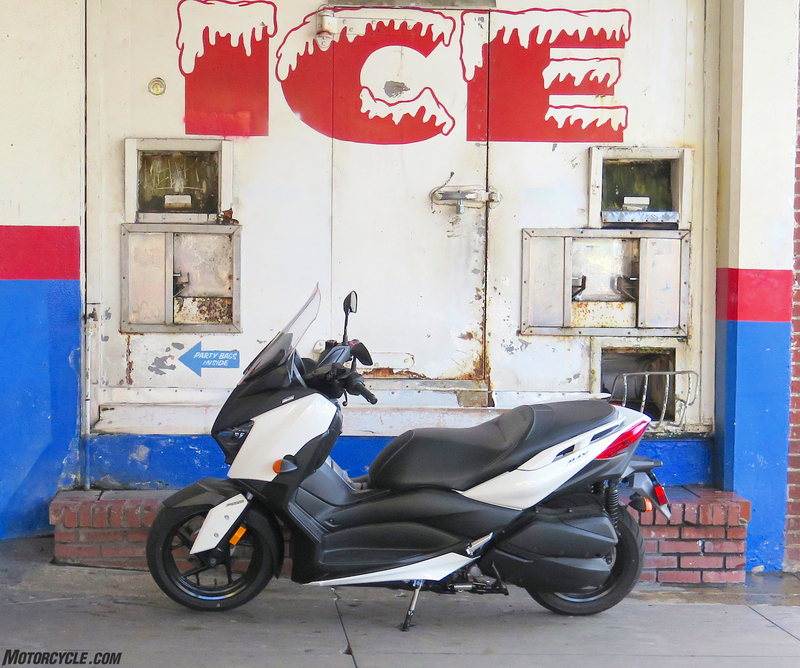 I mean, yeah, it’s no TMAX, but for nearly half the price, not bad – and even at that speed everything was perfectly stable. Could it get any cooler than this? 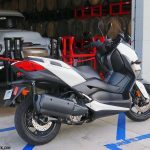 Your roll-on performance from about 60 mph or so is not exactly door-blowing, but thanks to the CVT trans keeping the engine right in its sweet spot, the X feels substantially quicker than say, a Honda CRF250L or a Royal Enfield Himalayan on the freeway, not to mention more comfy and refined. Especially with a passenger. That big back seat is sweet, and there are also nice grab rails to strap things or women and children to. 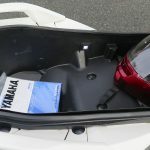 Underneath that seat, you’ll find a shining example of the reason for being of any scooter – a long storage compartment that’ll swallow two helmets or quite a few days’ of supplies or whatever – complete with an LED light for after-dark rooting around. It being the 21st century and all, the X comes with a remote key fob that means all you need to do to get underway is be within 10 feet of the scooter with it in your pocket, twist the midships-mounted control knob to Run, hit the starter and off you go. Turning the same knob to Open lets you hit the buttons that unlock the seat or the locking glovebox. 1950s Kenmore-style control knob in the middle, one glovebox on the right, and one locking one on the left with 12-volt outlet inside. If I have one complaint, it’s that this knob is kind of small and fiddly, with various jiggly push/pull detents and the overall look of a Bakelite dial from a 1950s Kenmore appliance. And it’s not backlit so it’s an even bigger PITA after dark. But you get used to it. Speaking of dark, though, the lights are all LEDs and the headlight puts out a nice, bright beam. All niggly complaints recede as soon as you get loose in traffic on the X. 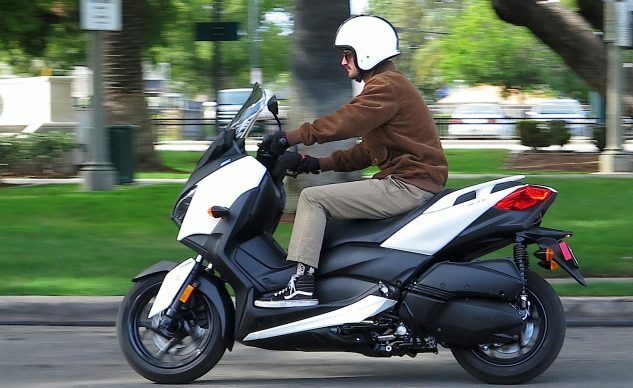 Somehow, a 27-horsepower scooter is still faster off the mark than 95% of cars (or is it that the scooterist just has a score to settle while none of the cars know there’s even a game on, much less the score?). 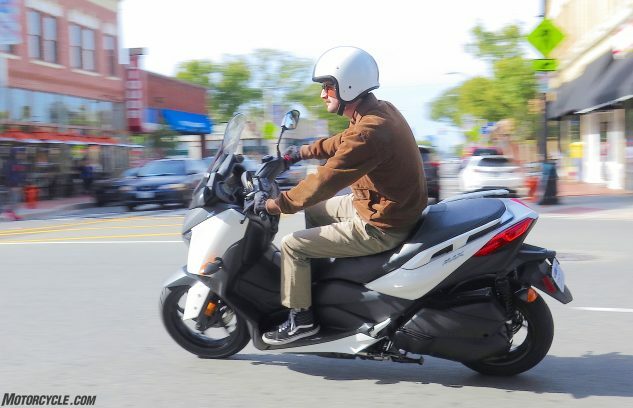 The XMAX’s continuously variable trans encourages you to just pin it away from every red light, and if I weren’t a California weenie I’d be out testing the traction control system right now in the current deluge. Holding the Info button down lets you disable traction control, should you get stuck in mud, sand or other soft surfaces says the manual. Plastic shields over the exhaust keep passengers from burning themselves. 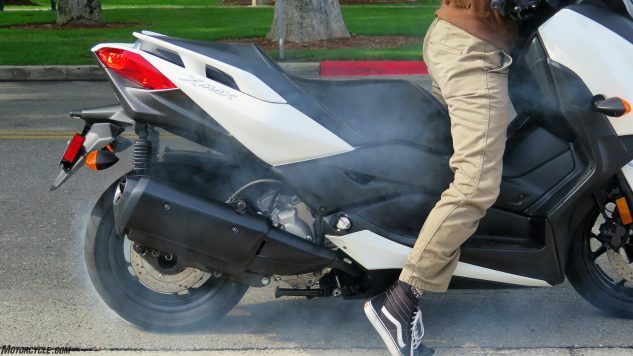 Centerstand is standard, so you can let the poor thing warm up before you blast off. Unlike a lot of scooters, there’s a genuine telescopic fork up front with non-massive 33mm tubes and decent damping. The rear end’s fine over smooth pavement and only adds to the drama over the bumpy stuff as you flog the XMAX around town for all it’s worth on your way to pick up a can of beans and some tortillas. Brakes, a 267mm front disc and 245mm rear, are plenty powerful when you give them a manly squeeze with both hands – front on the right, rear on the left – and no downshifting to distract you: The X steers nicely with both brakes on hard right down to the apex, then hard on the gas in a seamless, smooth transition as you catch the admiring glances of those waiting at the bus stop out of the corner of your eye at the exit… Bravo! The ABS is high-quality too: Stopping hard on wet pavement, I don’t think I engaged the system, and if I did I didn’t feel it. The seat’s great for all sizes and shapes, and ergos are likewise impeccable. This human specimen is 6 feet long. Up top, a good-size and shapely windshield protects the torso. It’s in the low position in these photos, and will go two inches higher if you care to break out the tools, for a bigger pocket of protection. 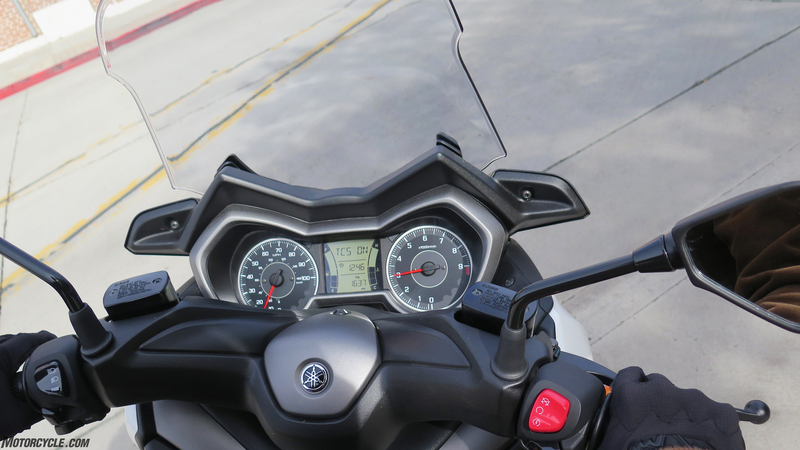 The handlebars can be pulled almost three-quarters of an inch closer to the rider, too, but the manual says to have your dealer do that. Get real. Dunno that a scooter needs a tachometer, really, but why not? Usually the needle hangs around 5000 rpm but goes to 7200 when you come over all WFO. LCD panel includes a clock, coolant temp, and gas gauges. 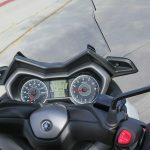 In addition to the tripmeter, there’s also an oil change tripmeter that tells you when it’s time (600 miles, then every 3000), a V-belt replacement trip (every 12,000 miles), and an info display that scrolls through air temp, voltage, TC status, average and instant fuel consumption, and average speed. That’s a size L Shoei Neotec modular, and the seat will close with two of them in there. Watertightness seems to be excellent, the X having sat out in a few deluges. The little white rectangle is the LED light that makes it easy to find things at night. In summation, if you haven’t guessed already, I love this thing. 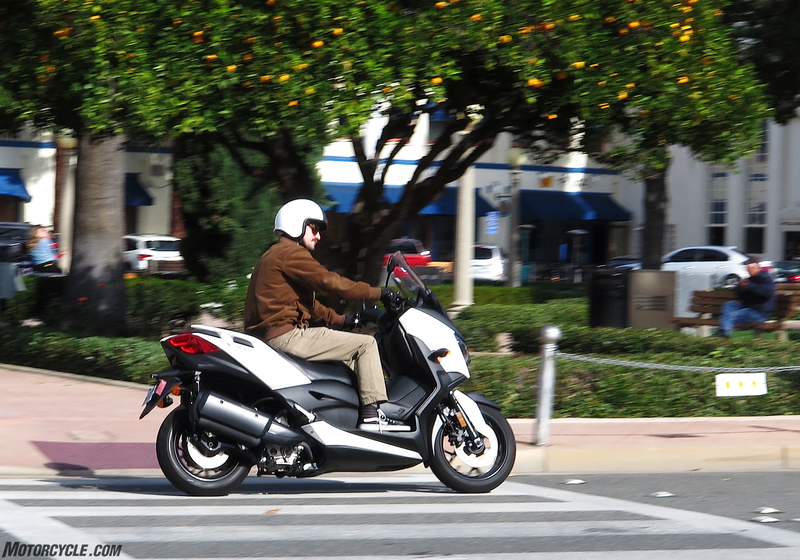 The only downside, for short people, is that the seat’s pretty high by scooter standards. I’m 5’8 with a 30-inch inseam, and my toes touch on both sides at once. Much shorter than me, and you might have a hard time at stops. (Honda’s Forza – also $5,599 – claims a 28.2-in. seat to the XMAX’s 31.3, but it’s not as speedy as the XMAX, has smaller wheels, lacks ABS, and is generally outclassed by the new Yamaha). 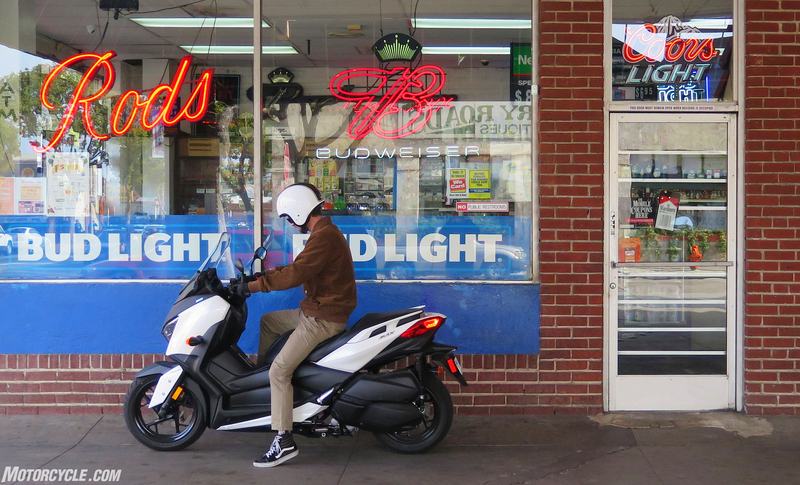 You find yourself looking for things that need doing around the house just for the opportunity to hop on the scoot and go for a ride to the hardware store. Say, are we low on coffee? BRB! Say, do we need to go out for a coffee at the new Urth Cafe that just opened, where there’s no place to park? Sure we do, and parking is no problem. Scooters seem to get a pass, since they ad to the Euro ambiance of wannabe hipster zones. The passenger seat’s pretty high, too, but broad and comfy once you’re up there. 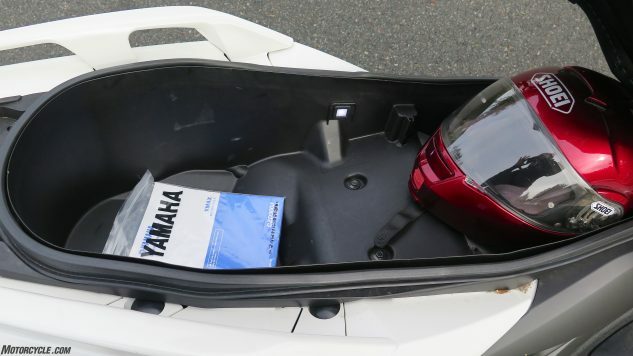 Throw the helmets in the trunk instead of lugging them around upon arrival. 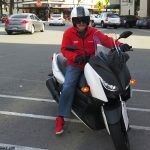 For the life of me, I still don’t understand why more people haven’t gotten the scooter memo. In warm, dry climates especially. Captain America probably wouldn’t have gotten shot if he’d been on a nice, non-threatening scooter. Oh yeah. 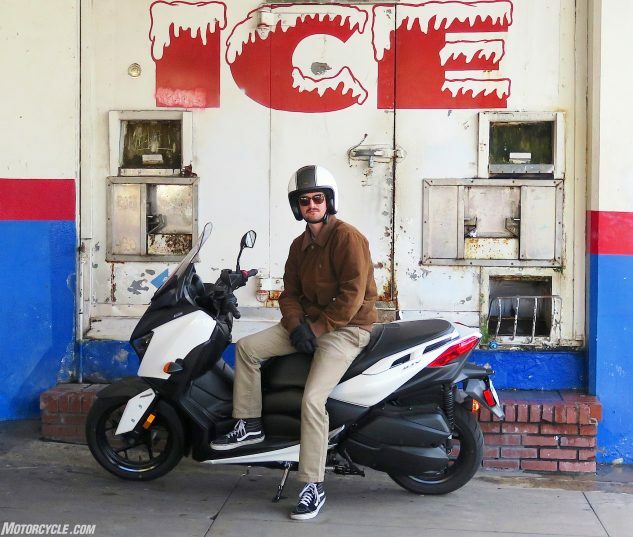 Electrics are nice, but in my weeks with the XMAX, I’ve averaged 70 mpg in spite of riding it like I stole it most of the time (even better, I borrowed it). 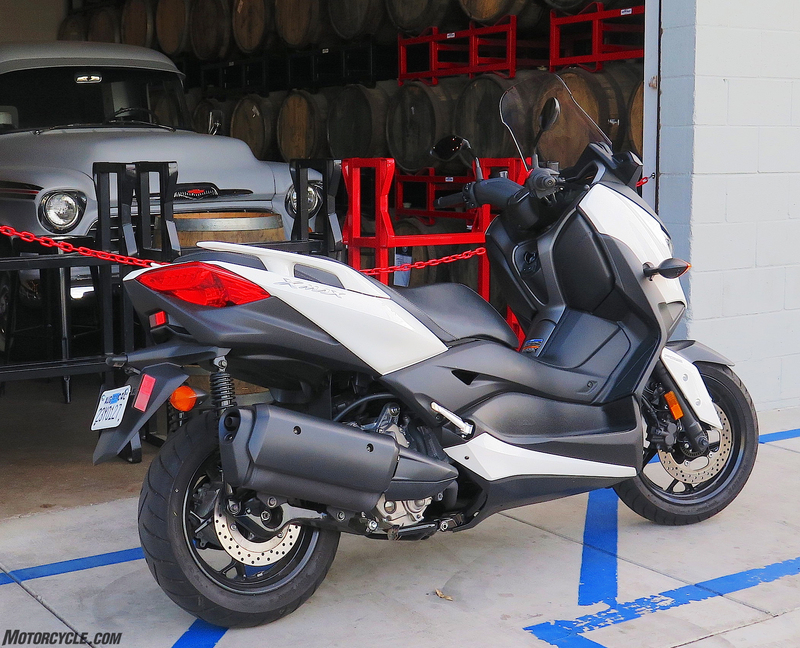 With its 3.4-gallon tank, that’s nearly 240-mile range, which means I’ve put gas in it twice in almost two months – the second time only so I could check the mileage. You’re also supposed to blow out the air filter now and then, and check the four valves every 12,000 miles. There’s a sight glass for the oil, and you should put in 1.6 quarts of fresh every 3000 miles. How hard could it be? I don’t think it’s just because I’m getting old. Our man Fabrice, the WERA-expert roadracer who helped us out in our last Superbike Shootout, has a new XMAX and loves it too. 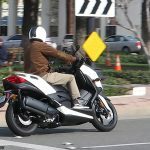 With this one, I think Yamaha solved the biggest problem it had with the TMAX, which was that it’s tough for most people to spend $11,000 for a scooter. 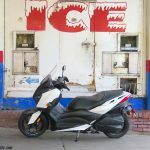 For nearly half the price, the XMAX is about 80% as good a scooter – but it’s about 99% as much fun and 110% as practical as the TMAX, thanks to there being 19% less of it. Every urbanite needs one of these, most of them just don’t know it yet. No need to thank me, just doing my part to save the planet. Cool R1-style headlights too. We are bad to the bone.